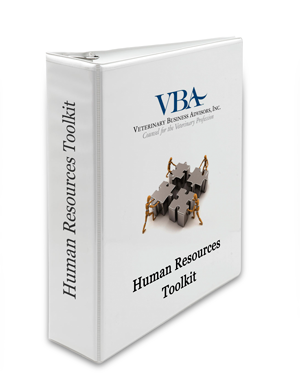 The VBA Human Resources Tool Kit simplifies the overall approach to people management in your practice, by providing you with the most up-to-date and comprehensive tools, tips, and practical tactics to managing employees of all levels. Developed by Charlotte Lacroix, DVM, JD, the Kit offers simple, actionable strategies, plans, and forms you can start using right away – along with a wealth of information to guide you. It also provides a broad overview of various laws and regulations governing the employee/employer relationship. As comprehensive as our HR Toolkit is, we understand that developing and managing your team is a very involved process. To help you navigate, we offer two additional tools that provide you with simple solutions to streamline the process. Optional Add-On: HR Coaching – Work directly with an HR Consultant to fully customize the Binder documents and who will coach you through implementing the process. The HR Consultant will teach you how to ask questions in interviews to find the right personality for your practice. Optional Add-On: HR Coaching – Work directly with an HR Consultant to fully customize documents and receive guidance on setting goals for managers/staff, coaching through tough conversations and other performance management issues.